January 2018 UPDATE: Dr. Regier recently received an honorary doctorate of science from Michigan State University! As editor of the Collegian, I am constantly on the hunt for stories about our alumni. Dr. Regier's offer to serve provided an opportunity to ask permission to write a piece about him, and to dig into the archives for more about this '48 grad. Like so many of our alumni, Dr. Regier's request was that an article would not focus on him, preferring instead to serve as a "navigational aid and not the message." He wished to steer the discussion toward challenging our students in their environmental studies and how NCC is assisting them in that field. He sent along a fascinating and thought-provoking essay to pique the students' interest and to suggest a possible alternative theme for the Collegian write-up. In response to his essay, I will be following up with that article in the coming months. Before that article is written, however, I want to reflect on the impact that alumni like Dr. Regier have on our world. His leadership in the field of environmental stewardship serves as an immense inspiration and example to our students and the rest of our NCC community. Our hope as educators is that our students aspire towards the same excellence and take advantage of every opportunity for service in their chosen fields - and become world changers. Therefore, Dr. Regier's request was unapologetically overridden in order that his example may challenge us to pursue our own unique role as stewards of God's creation. 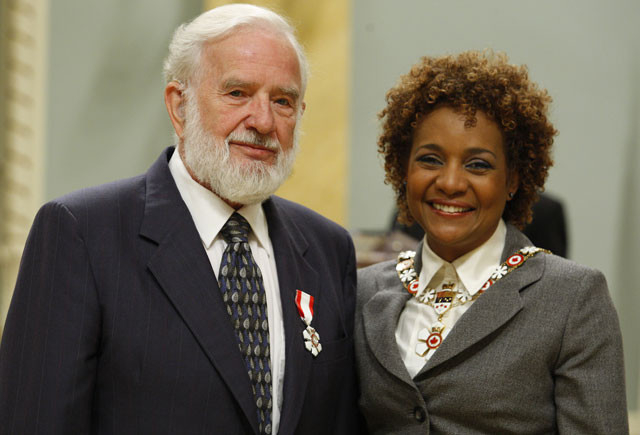 Some highlights of Dr. Regier's distinguished career include serving as the Director of the Institute for Environmental Studies from 1989-1994, and as Professor in the Department of Zoology from 1966-1995 at the University of Toronto. In 2007, the Intergovernmental Panel on Climate Change was the co-winner of a Nobel Peace Prize for responsible documentation of the risks of climate change. Dr. Regier served as a lead author of one of many reports crafted by international teams of expert scientists that contributed to that award. Regier has certainly lived up to his principles: "When talking to Mennonites and BIC friends about my professional work, I emphasize that my personal ethical praxis has been consistent with that of the five-hundred-year legacy of our Plautdietsche Mennisten. Like my ancestors in general, I’m a pragmatic Christian; the Walk is a more reliable indicator than the Talk." That being said, Dr. Henry Regier's "walk" continues to serve as a very reliable navigational aid for students, educators, and citizens whose mission is to make a difference. My hope is that we can emulate that same commitment and faithfulness to our own unique callings. Whatever your field of interest, you’ll be intrigued by his work, achievements, and awards, and no doubt inspired by the man himself. Regier’s multi-disciplinary approach, his leadership in the field of environmental stewardship, and his influence on power-brokers and political decision-makers is sure to impress. Read what colleagues at the University of Toronto’s School of the Environment had to say in tribute to Dr. Regier. The Aquatic Ecosystem Health and Management Society (AEHMS) also organized a special tribute symposium at the 53rd Annual International Association for Great Lakes Research (IAGLR) Conference (18 May 2019) to honour Dr. Henry Regier. In 1968, Henry Regier convened a “Teach-in” with colleagues at the University of Toronto on the issue of Human Population. This was a pivotal time in history, when counter-cultural movements were rapidly effecting change throughout North America. Age-old paradigms were crumbling, and both church and state were at odds over various issues of civil rights, gender equality, reproductive rights, etc. Regier’s resulting publication “Exploding Humanity - The Crisis of Numbers” documented this series of events. Although retired, Dr. Regier remains active on issues relevant to environmental causes. For more information on Henry Regier, check out his Curriculum Vitae.